The year 1983 saw the eruption of a 25-year civil war in in the island country of Sri Lanka that claimed the lives of an estimated 100,000 people. Fought by the Liberation Tigers of Tamil Eelam (LTTE), an organisation which sought to create an independent Tamil state called Tamil Eelam in the north and the east of the island, and the Sri Lankan government, the war ended with the defeat of LTTE in 2009. Forced to escape the horrors of this war, former refugee Caliyugan (Cali) Nathan, who grew up in an island village in northern Sri Lanka, recently spoke to the eRecord about his story of escape, survival, adaptation and current work within community life. “The year in which the civil war began in my country, my father was tortured, almost killed and had his business burned to the ground,” said 30-year-old Cali, speaking of an incident that predated his birth, but remains a significant mark on his family. Aside from this event and the constant sound of war planes flying above his residence, Cali had a relatively happy childhood, growing rice, tobacco and vegetables with his family and spending recreational time with his cousins. This period of peace and stability was, however, short lived. The situation of conflict near his village took a turn for the worst and one morning, without warning, he was forced to flee with his family, taking nothing but the clothes on his back. “I remember my dad was pushing me on a bicycle and every time we heard a shell close by, he would push me to the ground. The parents used real force to keep their kids safe, and it was only when we stopped at a temple to rest that I saw my knees were covered in blood. “There were fires by the side of the road, random fires with thick black smoke. It was dead bodies being burned,” Cali recounted, still in disbelief at the brutality of what he witnessed as a small child. After reaching the Sri Lankan capital, Colombo, and settling there for a time, Cali’s father waited for the first opportunity to move his family to Europe and, in 1995, he took it. It was not long before Cali was in a primary school in Holland, learning Dutch and playing table tennis and soccer with new friends. Unfortunately, due to their asylum claims being rejected, this period of peace was also short lived and Cali and his family were forced to return to Colombo, Sri Lanka. Adaptation was once again fundamental to Cali, who was now a teenager, in order to survive within a familiar yet changed environment. Rules were much stricter in Sri Lanka than in Holland and cultural differences were more pronounced. Despite ongoing peace talks between rebels and the government, the situation deteriorated and local bombings were once again the order of the day. “On top of the bombings, there were kidnappings and arrests. Under the Prevention of Terrorism Act, the police and military had the right to detain anyone, without reason or evidence, for up to 18 months. “You didn’t have to do anything wrong to get arrested if you were Tamil – and they could tell by the name on your ID – they could arrest you for nothing. And if you’re in a Sri Lankan prison, it’s not like a prison. It’s more like a torture house,” Cali said. 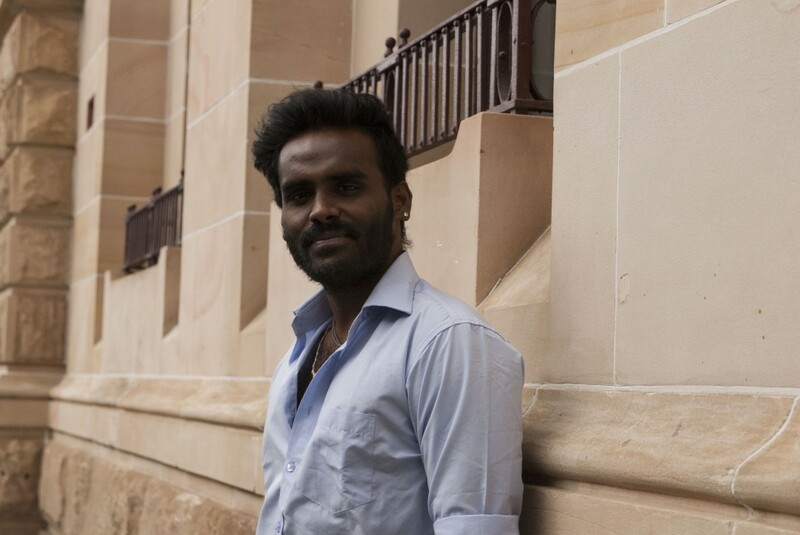 At this point, struggling with the desire to join the Tamil Tigers and seek justice against what he believed was an oppressive government, Cali left Sri Lanka and eventually decided to seek refuge in Australia. As with many of those wanting to undertake the journey to Australia by boat, Cali went through four to five different countries before boarding a boat in Indonesia. His traumatic experience of the trip has remained as impressed on his mind as the violence he witnessed back home. “Once I boarded the boat, I was told we would have to go in small groups of about ten people towards a bigger ship that was waiting eight hours away. We reached the ship and waited for other groups to arrive. Days turned into weeks. “One night, after about three weeks of waiting, I was sitting on the top deck at around 3am and I saw a vessel approaching our boat. We didn’t signal to other boats in case it was the police, so I just sat and watched the small boat in the distance. “The next morning, we discovered that the boat had been heading towards us carrying 13 people. They couldn’t see us in the dark, the conditions were not good, and they decided to turn back. The sea was too rough and the boat too heavy. Cali’s boat eventually set off and reached Christmas Island under harrowing weather conditions. In the middle of 2011, after 17 months in detention, he was finally released into the community. “It was so overwhelming being free. I walked around the city for hours, touching, looking and smelling. I’d relied on other people for so long to tell me what to do. “I know I am lucky, there have been so many people who haven’t made it. Immigration policies are much harsher now, so I’m one of the fortunate ones. I try to feel lucky and I try to feel happy, but sometimes all I feel is an overwhelming sense of guilt that I’m safe and so many aren’t. “My dream is to go home to my family. The sense of feeling at home is so unique, a unique and significant feeling that you can never buy and you can never fake. The love for your country is like the love for your mother; it can’t ever be replaced. “To be back on the farm where I grew up, running through the rice fields; that would be freedom for me,” Cali said. Cali has since managed to obtain a secure job in IT and has been involved with refugee rights activism as well as cultural and sports programs. One such program is named Tamil Eelam Cricket. This volunteer-run initiative was set up by Cali with the aim of providing common ground for Tamils to come together with their new neighbours and close the gap between new and existing Tamil communities in Perth. “With a common interest such as cricket, there is an added bonus that it is easier for Tamils to integrate into a new culture without, of course, losing their own culture,” said Cali. “It can promote a sense of belonging and pride within the world Tamil Family, and represent Tamil Eelam on a global platform promoting Tamil culture and identity,” he concluded. To find out more about this initiative and how you can be involved, visit www.tecricket.com.